*OUTDOOR ANIMAL SHELTER MUST BE SUITABLE FOR INCLEMENT WEATHER: …and if it’s not, animal welfare officers can rescue the pet even before he or she shows signs of suffering, thanks to New York State’s Shelter Law that went into effect in 2003. Read more about that law here. 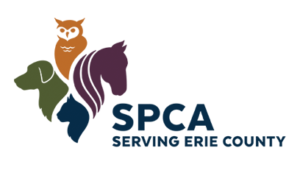 Thanks to a legislative push late last year that led to stronger laws concerning the tethering of dogs within Buffalo city limits, the SPCA and other law enforcement organizations can now take even more steps to ensure dogs are protected from the elements. Read about that new law here. * Keep a Tight Leash: Never let your dog off the leash on snow or ice, especially during a snowstorm. Pets frequently lose their scent on snow and ice, especially if snow is falling at a fast rate, and your pet can easily lose his sense of direction. Pets may also panic during a snowstorm and run away; many pets are lost during the winter months. Remember to keep current identification on your pet at all times! *Keep Pets At Home: Never leave your pet alone in a car during cold weather. A car can act as a refrigerator in the winter, holding in the cold. Your pet could literally freeze to death. *Always Dry Pet’s Wet Feet: Thoroughly wipe off your pet’s legs and stomach when she comes in and out of the rain, snow or ice. Check her sensitive foot pads, which may be bleeding from snow or ice encrusted in them. Your pet may also pick up salt and other chemicals on her feet accidentally. These chemicals could hurt her if she swallows them while licking her feet. *Check Cars for Cats: During the winter, stray or neglected cats outdoors sometimes sleep under the hood of the car where it’s warm and comfortable. If you start the motor, cats could get caught in or flung about by the fan belt, causing serious injury or death. To prevent this, bang loudly on the hood and sides of your car before turning on the ignition to give the cat a chance to escape. *Keep Outdoor ‘Sessions’ Short: Take your dog outside only for as long as it takes for him to relieve himself. Dogs, particularly small, short-haired breeds like Chihuahuas and terriers, suffer from the cold despite their seemingly warm fur coats. Live within Buffalo city limits? Read about the new law pertaining to the tethering of dogs in inclement weather. *Bathe Pets Only When Necessary: Your pet runs the chance of catching a cold when wet, especially in cold weather. If you absolutely must bathe your pet, consult a professional groomer or veterinarian. *Keep Pets Warm: Limit the clipping of your pet’s hair in the cold winter months, keeping your pet as warm as possible. Brush your pet daily in lieu of clipping to keep your pet’s coat healthy, shiny, clean and mat-free. Make sure your pet has a warm place to sleep far away from outside drafts. *Hungry Pets: Speak to your veterinarian about increasing your pet’s supply of food, particularly protein, to keep his fur thick and healthy through the winter months. Inquire about vitamin and oil supplements. *ANTIFREEZE IS POISON TO PETS: ANTIFREEZE, EVEN IN SMALL DOSES, IS A LETHAL POISON FOR DOGS AND CATS! Because of its sweet taste, animals are attracted to it. Be sure to clean up spills thoroughly, and consider switching to an animal-friendly antifreeze. Ensure that, if you store Antifreeze in a garage, shed, or other places accessible to your pets, it is well out of pets’ reach. If your pet becomes lost, be sure to visit YourSPCA.org’s Lost and Found page for recommendations on where to post lost pet listings, and tips for finding your lost pets.